1. Transport. We were told a 4WD is a necessity. I guess I thought that meant they’d pretty much be the only cars we’d see. Actually there’s a great range. 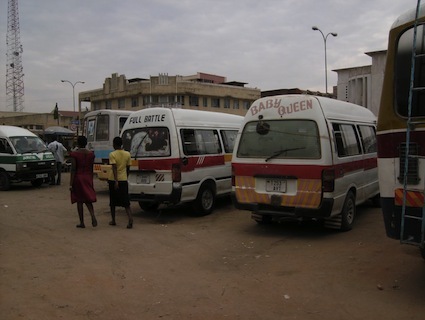 In terms of public transport, most popular is a mini-bus called a dala dala. There are also taxis (turquoise sedans) and pikipikis bodabodas (motorbikes with a passenger on the back – helmet optional for the passenger!) That said, a 4WD is certainly useful, not just for long trips but also for the pot-holed dirt roads, when it’s wet, when you have to go ‘off-road’, or when there are roadworks i.e. piles of dirt in the middle of the road. 2. Wildlife. We knew Dodoma doesn’t have the ‘big animals’ of Africa but it can still get pretty noisy between the goats, cows, chickens, stray cats and guard/stray dogs. 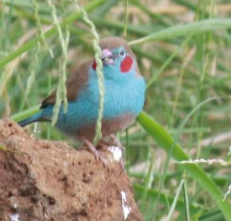 The real surprise has been the delicate and beautiful bird life. This little guy is a cordonbleu. 3. Bugs. When we visited churches in Adelaide and Melbourne, we told people about Dodoma’s scorpions and mosquitoes. What we didn’t know about were the teeny tiny ants that don’t bite but swarm over any food left out for longer than 5 mins, the bumblebees that burrow into the wood of our house and snore, or the harmless but huge yellow beetles that fly around our heads. 4. Hairdressers. People of Bantu origin are not that hairy, so to have hair extensions is the height of fashion. Going to the hairdresser is about getting more hair, not having it cut, at least for women. That totally makes sense but the thought hadn’t occurred to me before we arrived. 5. Time. 1 o’clock in Tanzania is the first hour after sunrise – 7am. Tanzanians are completely perplexed by the idea of starting the day in the middle of the night, quite rightly, it seems to me! I vaguely knew about this before we arrived but I wasn’t prepared for how much time in a day I would spend adding or subtracting 6 hours to work out the time! 1. In Uganda the motorbike taxis are called boda-bodas. In orientation they said “we do not recommend riding boda-bodas”. However I went for a short ride on one the day before we left, when I had lost the rest of the group. We were told vehicle accidents are the no.1 cause of missionary deaths in Africa, so be careful! 2-3. Animals were my least favourite thing about my month in Uganda. I got bitten by two dogs (didn’t bleed, but I felt the teeth), rats ate our clothes and there were all kinds of insects to contend with. 4. Hair extensions have been popular for years with African girls in Adelaide! 5. Like in the bible (eg Matthew 20). In most older translations this comes through literally. Tz is tropical enough that length of daylight doesn’t vary too much through the year. Dear Tamie, thank you for this blessed messages and is strengthening much. Babu.